I just stumbled across these old pictures and thought I would share them. 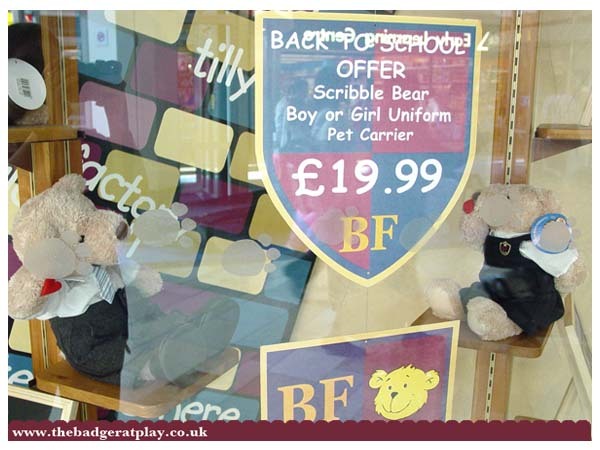 Back in the day I worked at Bear Factory Bristol (the one in the Galleries, not Cribbs Causeway) and they let me loose to have a go at the main window display. This was for the back to school promotion and I am not sure why I was given the chance as a lady named Minx was the VM and an amazing one at that! I am sure I did a good job because our store won awards for the displays. 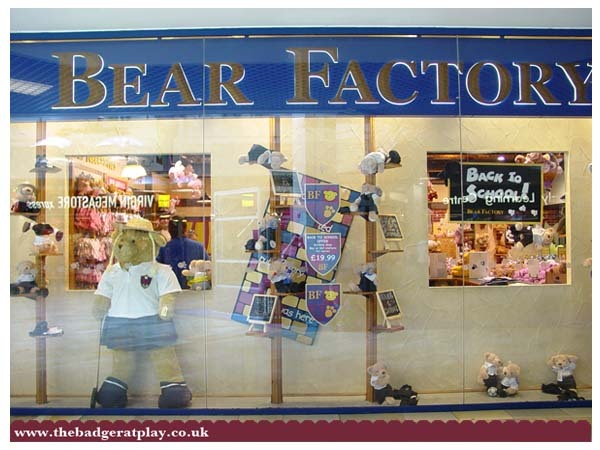 We used to nick sand form the ELC opposite for summer displays and went crazy with the bear stuffing for christmas displays, nothing was done by half’s at Bear Factory! 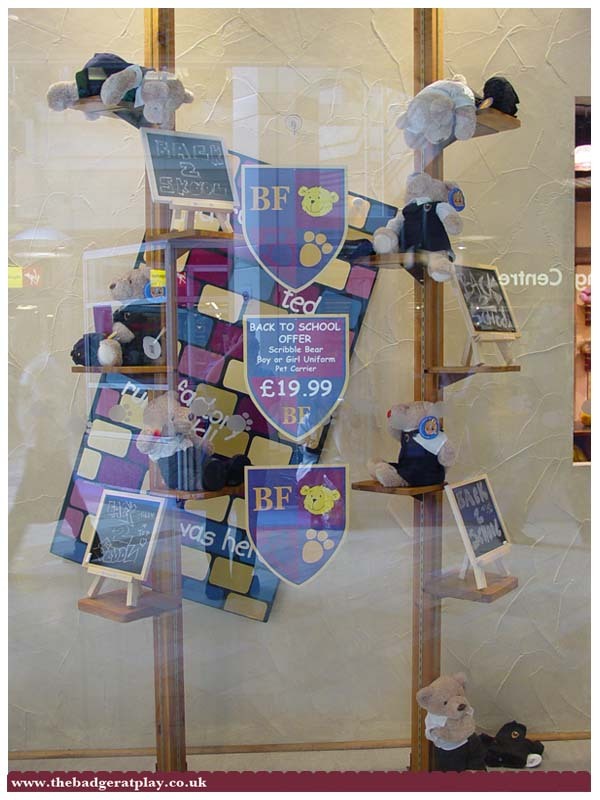 It was amusing to get the display done as it is a very small space, climbing all over it and having people stare as you do it! Good fun though. I have to apologize for some of the pictures, the shiny windows made it a nightmare to get decent views as everthing reflected in the glass. Hope you get the idea. 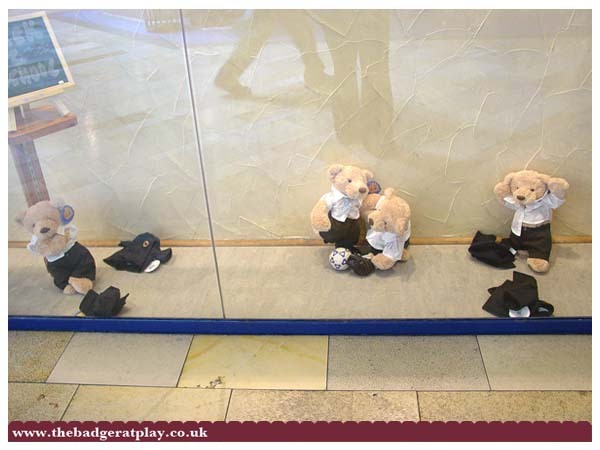 Cheeky bears, just like kids they get up to mischief if you don’t keep an eye on them! 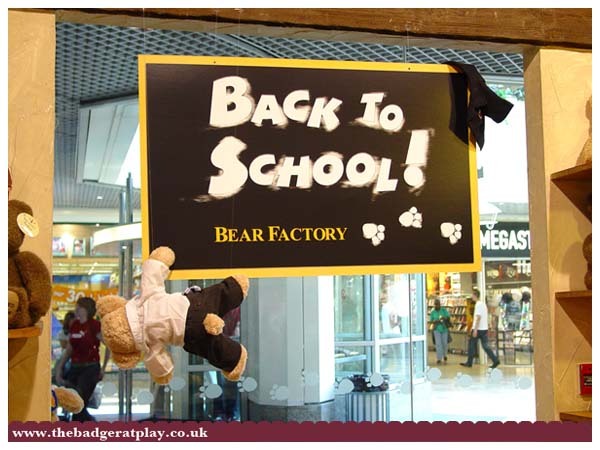 If you look closely the girl bear on the right is blowing a kiss to the boy bear on the left. If you look closely again you will see the boy bear has caught the girl bears kiss! Enough to make you feel sick! 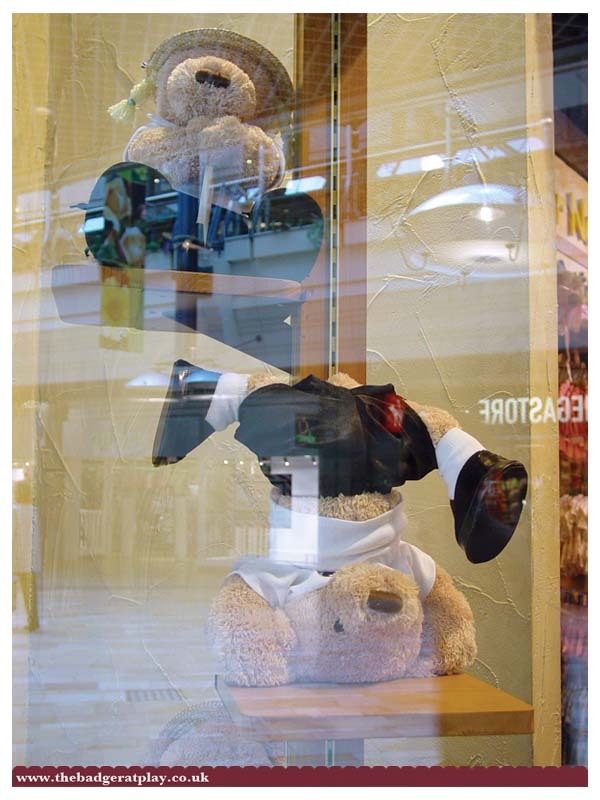 Acro-bear-tics! All basis of school life covered, sports included. 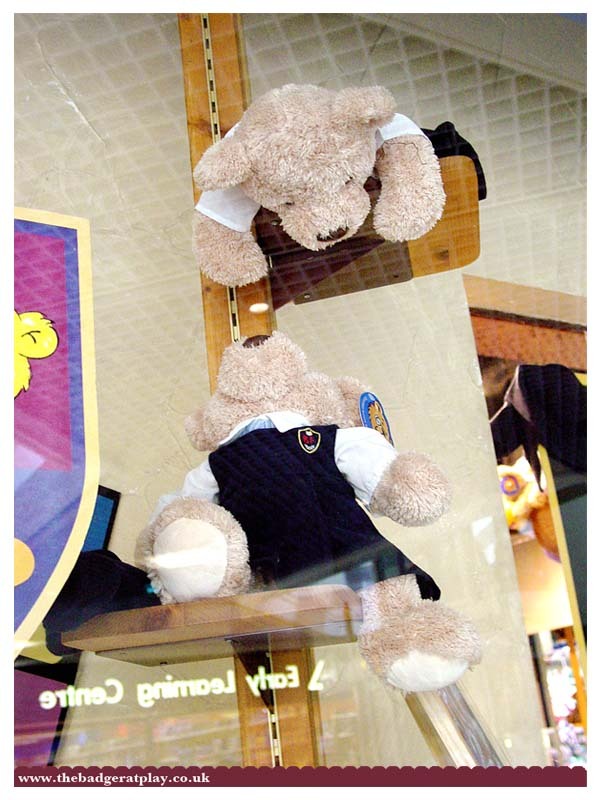 Getting this bear to balance was a nightmare. The one at the top was based on St Trinians with the hat and hockey stick. 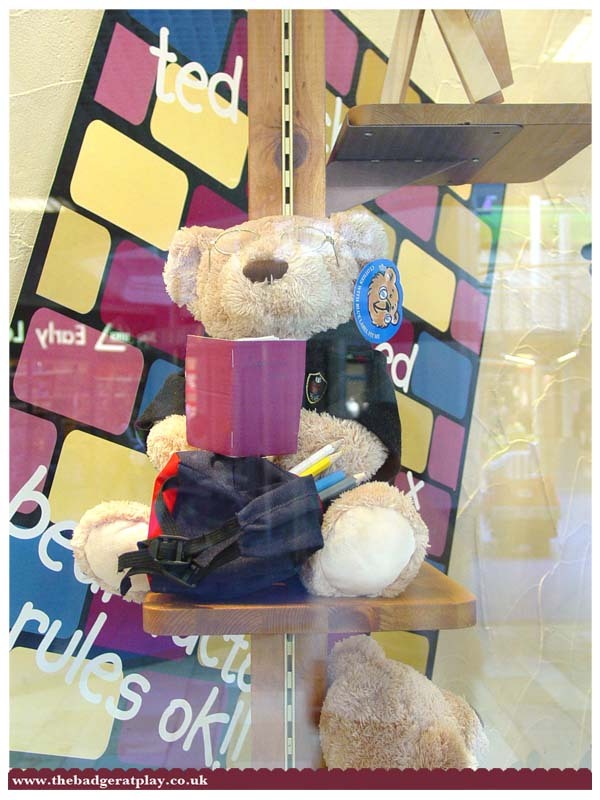 Some take school work beary seriously! I love his little reading glasses. No school is complete without boys kicking a footie around the playground. And no make-shift footie pitch is complete without blazers/jumpers for goalposts! Scruffy little bears they are. 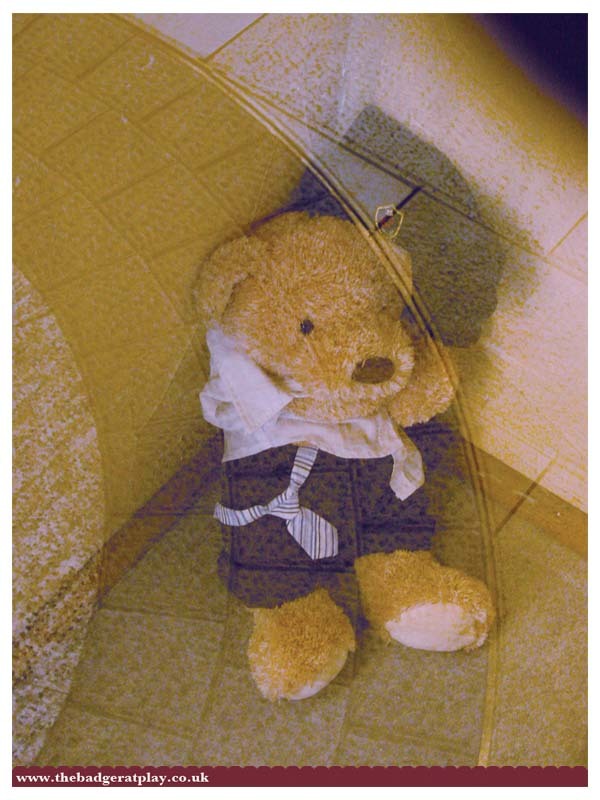 This little scrufty bear was asleep in the corner, no doubt he should have been in detention for not paying attention in class. There is always one daredevil getting up to tricks. This one snuck past me. Look at his blazer on the other corner. Cheeky chappy! 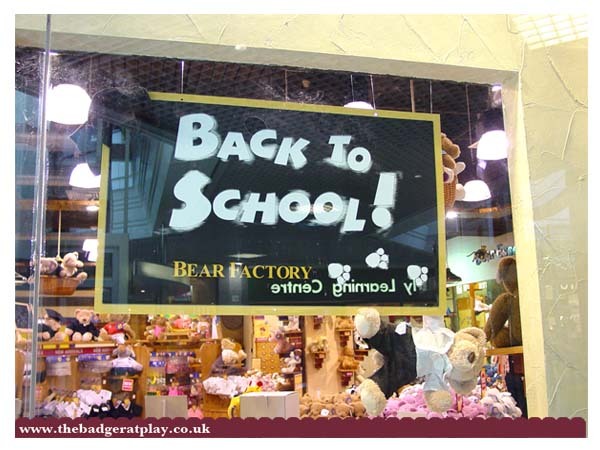 Naughty bears have been graffiti-ing the blackboards! We also had a new range of nightwear we had to show off. 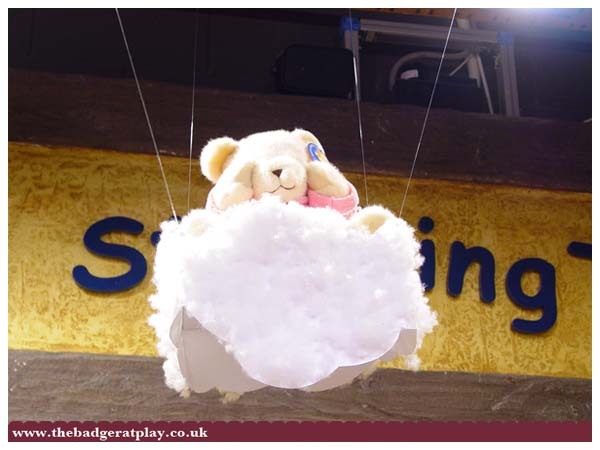 Thought it was cute to have them sat in clouds! Best part was one of them snuck home with me. My birthday is in September, so shortly after all this was done we had a store birthday party (partly as training for when we did them for the little kids, but mainly to let our hair down!) 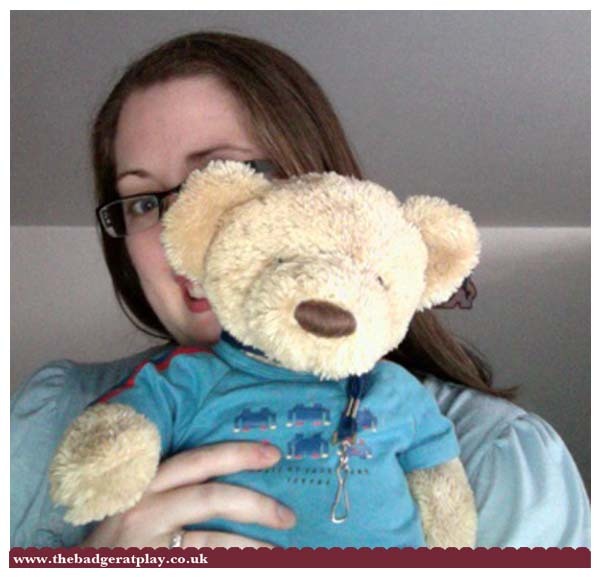 So I had to take a Scribble bear with me. This one is called Scribbalus and he likes to look cool with his Space Invaders t-shirt. He is especialy proud of his necklace, this used to have a tag on it that said VIB (Very Important Bear!) that may have fallen off, but he is the only one with the cord! I love his cheeky chappy look, he is a perfect teenage bear! That is my fave part, looking through all the bears to find one with the perfect expression, they are indeed all different!